Taking advantage of a gravitational lens to study a galaxy more than 12 billion light years away, astronomers using the Atacama Large Millimetre/Submillimetre Array have detected an enormous outflow of gas that shows how some galaxies in the early universe managed to stop runway star formation. In galaxies like Earth’s Milky Way and nearby Andromeda, a new star fires up about once per year. But in starburst galaxies, hundreds to thousands of new stars ignite each year, a pace that rapidly consumes available reserves of gas and dust. But some starburst galaxies manage to throttle back such rapid growth by ejecting, at least temporarily, vast amounts of material in extensive halos. Some of that material then escapes altogether or falls back into the galaxy, triggering fresh bursts of star formation. Finding direct evidence of such outflows in the early Universe has been difficult. 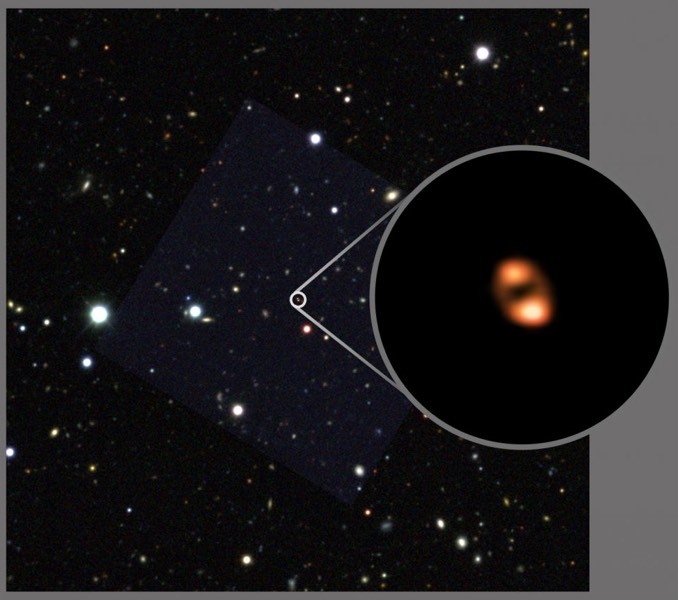 But now, thanks to the magnification provided by the gravity of an intervening galaxy, Spilker and a team researchers using the ALMA radio telescope array have detected a huge jet of debris flowing out from a galaxy known a SPT2319-55 just a billion years or so after the Big Bang. 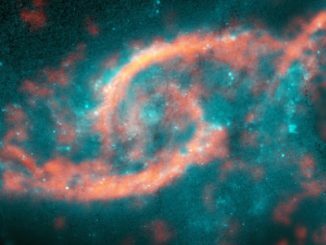 Using the fortuitous gravitational lens, ALMA was able to detect a powerful wind made up of star-forming gas blasting out of the galaxy at nearly 800 kilometres (500 miles) per second, exiting in clumps. The winds likely are generated by a combination of rapid supernova blasts and massive star formation or by the energy released when huge amounts of material are sucked into a super-massive black hole in the galaxy’s core. “So far, we have only observed one galaxy at such a remarkable cosmic distance, but we’d like to know if winds like these are also present in other galaxies to see just how common they are,” said Spilker. 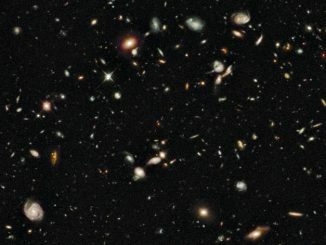 The first stars appeared about 100 million years after the Big Bang. When the universe was about 3 billion years old, star formation activity peaked at rates about ten times above current levels. 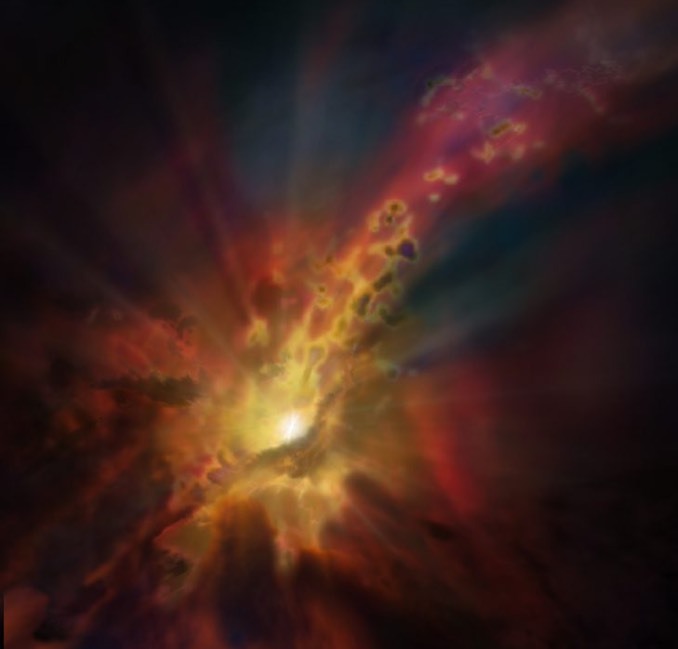 Why this happened, and whether the physical processes back then were different from those today, are among the most pressing questions in astronomy. 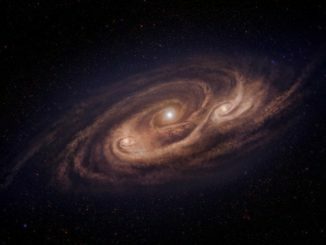 New observations of a starburst galaxy using the Atacama Large Millimetre/submillimetre Array resolve vast, unstable clouds thousands of light years apart that are thought to be sites for rapid-fire star formation.